As much as I love to eat healthily, I can’t say no to chocolate! Making my desserts are a lot healthier than buying box dessert…so here is my recipe for Dessert Brownie Mix in a Jar. By making your own Dessert Brownie Mix in a Jar, you are not only saving money, but you don’t have any preservatives like in some boxes! If you don’t have or want to use a jar, just grab a ziplock bag and fill it with all the ingredients and you can make it anytime you want. This is very simple recipe the little ones to help you out! 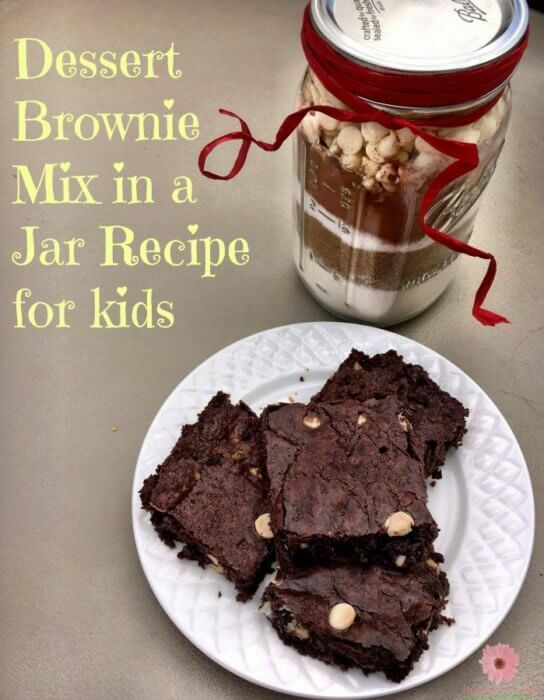 Here is what you need to make a Dessert Brownie Mix in a Jar. To make Dessert Brownie Mix in a Jar, fill your jar with, 2/3 cups of sugar. Then put in 1/3 cups of cocoa powder. Then place 2/3 cup of brown sugar. Then place 3/4 cups of all-purpose flour. Next, add 1/2 teaspoon of baking powder and then a 1/4 teaspoon of salt. Finally add on the top, 3/4 cup of chocolate chips. I love to add peanut butter chips as a special treat! Fill the jar with the ingredients in this order. Make sure the rim of the jar is completely clean before adding the lid. Seal completely, and you can add a square of fabric depending on the season or occasion. These make great teacher gifts or gifts for your neighbors. Just be sure to leave them instructions. Preheat your over to 350 degrees. Pour the mix into a large bowl. Add 2/3 sticks of melted butter. Mix in two eggs and two tablespoons of coffee. You can use water instead of coffee if you prefer. You will not taste the coffee, but it will bring out the rich flavors of the chocolate if you do use coffee. Mix well and then pour batter into a greased 9×9 baking pan. Bake for about 20-25 minutes. Check brownies to make sure batter is completely cooked. Add a scoop of vanilla ice cream or enjoy plain. Check out these other great Cooking with Kids- How to series recipes: Chocolate chip cookie dough dip, and Chocolate Chip Cookie ‘lasagna‘. 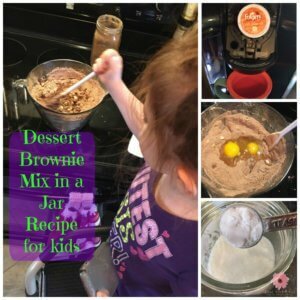 Enjoy your Cooking With Kids- Dessert Brownie Mix in a Jar recipe: as a gift for a hostess, a quick mix, or a yummy seasonal dessert!